2017 was a bit of a crazy year for us at Holland Sports, which meant our newsletters were a little ‘newsless’! So, to kick off the new year, we thought we’d put some effort into giving a brief run down of what happened in 2017, and what is yet to come in 2018! Firstly, we would like to thank everyone who supported us during 2017. Not just our members, but everyone who attended the various events we held. At the end of 2016, we’d heard that Tandridge District Council were planning to upgrade the old 5 a side football area at the rear of the club to a new Multi Use Games Area, but this couldn’t happen until the council had secured more funds. As a committee we decided to make a donation of £2000 to help achieve this. The plan was for a fully fenced football / basketball and tennis court area, and this was installed at the beginning of 2017. It has become a very popular area for both young and old in the community, and a much welcomed addition to Hurst Green. The next few months were a little bit of a blur…….! There were the usual live band nights, we had a complete furniture upgrade throughout the club, and we were joined by the fabulous Emily who is doing a smashing job of keeping the bar running smoothly. But the main thing that kept the committee busy was planning for the HS Fest! The idea was first put forward by Simon who suggested having a fundraising event for a local cause. A couple of bands on the patio, spark up the bbq’s, maybe a couple of firkins of local beer. Once the committee had decided on the local good cause, Clockwork, things sort of spiralled into something much bigger! 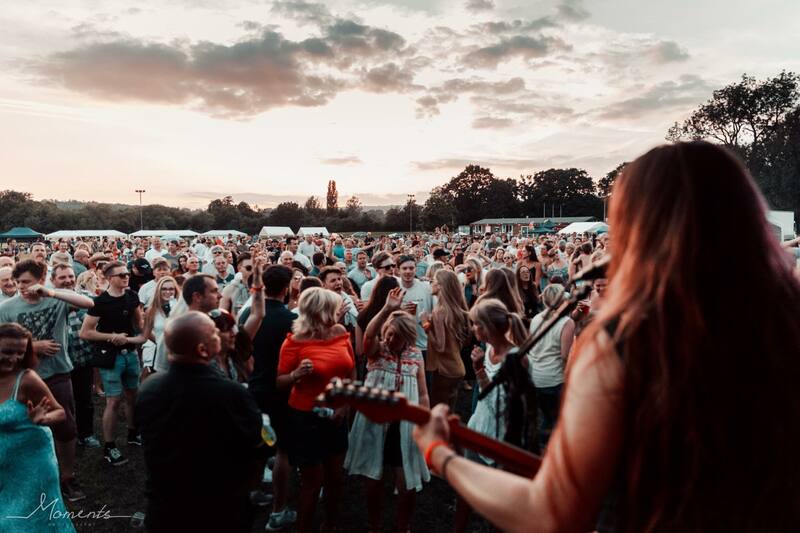 More than a dozen live acts over two stages, a double decker “Creme Egg” bus with kids disco and face painting, a kids fairground, numerous arts and craft stalls, and a huge selection of food. A massive thank you goes out to everyone who gave up their time organising, donating and helping on the day, and every one of you who came along to support. Between all the Holland Sports clubs, we raised nearly £6500 for Clockwork, which is currently being used to build the Clockwork HQ in the centre of Oxted. Planning for the 2018 event ,Saturday 16th June 2018, begins next week so make sure you add the date to your calendar. And probably put in the Sunday too so you can recover! Another huge success this last year was our Fireworks Night. Again, another free entry event (we like to give the community something for their support throughout the year where we can) that was attended by around 1500 people. With the surplus funds collected by Titsey Rotary Club on the night, we were able to donate £500 to both Holland Junior School, and Hurst Green Schools for their PTA’s to put to good use for the respective pupils. During the year we also put some effort into improving the drinks selection on offer behind the bar. Bob was put in charge of sourcing our bottled ales, and we usually have around a dozen different ones to try. Our premium spirits selection has also been increased, with over 20 new gins, and a range of bourbons, vodkas and whiskeys. So, what’s planned for 2018? Much the same as 2017, but with a few tweeks! We’ll soon be starting the planning for the music fest in June. Then, we’ll be planning for the Fireworks. In between there will no doubt be a few of our weekend band & BBQ events on the patio. The monthly Acoustic nights will be starting again soon, and our regular Saturday live music nights will be bringing you some of the finest local musical talent. Poker – Every Tuesday night from 8pm. Get there around 7.45pm for a good seat. Prize Darts Tournaments – Fortnightly on a Thursday (11th & 25th Jan to get you started!). £5 buy in, min £50 first prize. 7.45pm start. Acoustic Nights – Monthly on a Thursday evening. Check Facebook for next date. Bake Off’s – Victoria Sponge bake off on 17th Feb. Future ideas include BBQ (Burger Off?) , Pasties and other baked goods! Sunday afternoon Band & BBQ’s. Sky and BT Sports showing all major sporting events. One of the main questions we keep seeing asked online is “Don’t you have to be a member to go to Holland Sports?“. Well, yes and no! All our big events are run with a Temporary Events Notice, which means the club is licenced to supply alcohol to the general public. But, for any other time we are open, non members are allowed to visit as guests a maximum of 3 times per year. Just ask at the bar for the guest book, fill in your details, and pay your £1 into your chosen charity box on the bar. We’re confident that after buying your first drink you’ll be asking for a membership form, or filling one out online using our free Wifi! Membership runs from 1st September to 31st August and is just £15 for a single adult. Couples £20, and Families £25. Thanks for reading, and keep an eye on our Facebook page to hear about future events!